By Kori ~ August 1st, 2012. Founded by Rich Frank and Koerner Rombauer in 1996, Napa Cellars was acquired by Trinchero Family Estates ten years later. Trinchero Family Estates has been producing wines for over 60 years. Through the years, the Trinchero family and the company have expanded. Today, Trinchero represents over 27 brands in the United States and Australia. Winemaker Joe Shirley received his Master of Science in Enology from UC Davis and launched his winemaking career in 1997. He joined Trinchero Winery in 1999 and worked his way up to winemaker for Trinchero Family Selection and Trinchero Napa Wines in 2002. In 2007, Joe was named head winemaker for Napa Cellars. Recently, we had the opportunity to taste the 2009 Stagecoach Vineyard Cabernet Sauvignon from Napa Cellars in a blind samples tasting. It is outstanding and delivers serious bang for your buck, especially for a Napa Valley Cabernet. Stagecoach Vineyard is an unusual vineyard site in the Napa Valley, stretching from Eastern Oakville to Atlas Peak and climbing to 1,700 feet above the valley floor. Due to the cool nights and long, warm days at Stagecoach Vineyard, the Cabernet Sauvignon grapes enjoy extended hang time that helps them develop more concentrated flavors. 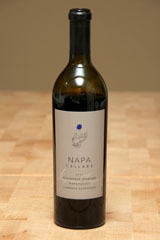 2009 Napa Cellars Stagecoach Vineyard Cabernet Sauvignon (Stagecoach Vineyard, Napa Valley, California): Dark purplish red in color. Gorgeous nose with mint, evergreen, and floral aromas. Blackcurrant, blackberry, cocoa, and mint come through on the palate. Medium to full-bodied with lively acidity and medium to high tannins. Well-balanced with a very long finish.